"I always ask myself, what will matter to me the day I die? And for me, that answer is to experience what it is to be human and to live on this planet. So exploring every aspect that contributes to that will help me achieve that goal." 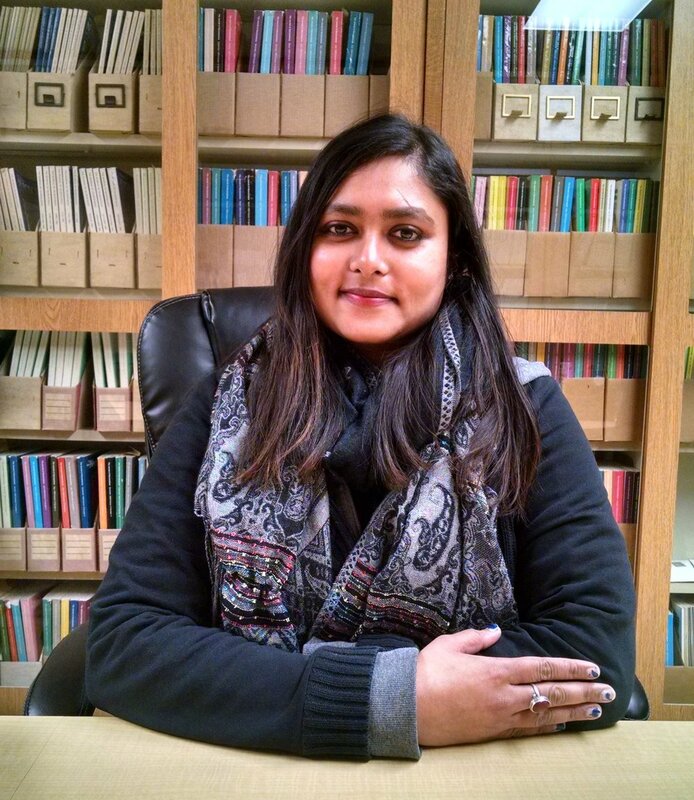 Yesha came to Chicago from India when she was seventeen years old, bringing with her a passion for biology that eventually led her to the neurobiology graduate program at UIC. When I first met Yesha, she was working as a tech in Dr. Janet Richmond’s lab. We talked about her choice to become a graduate student and how she balances grad school with her life outside the lab. This interview has been edited and condensed. Tell me a bit about your childhood. When did you realize that you enjoyed science? I come from the western part of India – Gujarat. I started to enjoy biology in the 8th grade, especially botany, human physiology and adaptations. We learned a lot about botany and agriculture as part of biology in India because agriculture not only used to be a way for producing food for families, but it also contributes to our economy. My grandfather owns a farm, and many members of my family are farmers, so botany made biology very relevant to me. I enjoyed all the labs and was just very curious. I also enjoyed studying about physiological processes. Before joining UIC’s graduate program, you worked as a tech in the Richmond lab. What made you decide you’d like to join the lab as a grad student? I got this opportunity to work as a tech during the last semester of my undergrad and I really enjoyed it because I was learning something new every day. After working in Janet’s lab for a year, I enjoyed being in her lab a lot. Everyone was very friendly. and I really liked being here and felt very settled in, so I kind of didn’t want to leave that. Why did you choose a Master's program instead of a PhD? I chose a Master’s because it allows more flexibility when it comes to choosing what you want to work on. I would want to experiment trying different positions or jobs. But I also like the idea of pursuing masters even if you are going into research, because I think that for beginners this degree serves as a primer to prepare you well. Describe your research as you would to your grandmother. I study pathways that help regulate synaptic transmission. So, the way I would explain it is that I study how brain cells communicate. Studying this is very important because that is how we are able to make movements, think, learn and form memory. What is your favorite thing about grad school? That we can customize what we want to learn. I like that we get access to different people doing different kinds of research and are able to get mentored by them. And I also enjoy TA-ing in the biology department because I feel that I am able to simplify and bring things to students’ level of understanding. What advice would you give other grad students? To think about the end-goal as well. Often we get so wrapped up in our research that we forget to plan our next steps. I think it is helpful to know where you are going so you can prepare yourself and take advantage of resources that your school offers. When you aren't in the lab, what do you enjoy doing? I enjoy writing, painting, drawing, reading, watching movies and exploring the city. What do you enjoy most about Chicago? Moving from India to here was difficult, but I have been able to make Chicago my home now. I like the lake, museums and the city itself. I truly appreciate that there are restaurants where I can get vegetarian food. There is both the chaos and rapid pace of the city and calmness of suburbs. And I also like that there are beautiful trails for biking and to be close to nature. I cannot choose just any one favorite! Some of my favorites are Dao Thai– they have the best spicy basil fried rice, and Miller’s Pub – they have very good spanakopita. If you weren't a Master's student, what would you be doing instead? If I weren’t in grad school but I was still in science, I would be working as lab tech and learning different techniques. If I weren’t in science, I probably would have been a psychologist or artist or writer. I am planning to work in regulatory affairs after graduating. In five years, I see myself just growing more in terms of my expertise related to my position. And I just want to keep trying different types of jobs and learning new things. When you are growing in just one direction, you only have a singular perspective and one way of looking at things. You lose objectivity. I always ask myself, what will matter to me the day I die? And for me, that answer is to experience what it is to be human and to live on this planet. So exploring every aspect that contributes to that will help me achieve that goal.